This article is about Søren Kierkegaard. For the topic of "anxiety", see anxiety. "The Concept of Dread" redirects here. For the topic of "dread", see dread. The Concept of Anxiety (Danish: Begrebet Angest): A Simple Psychologically Orienting Deliberation on the Dogmatic Issue of Hereditary Sin, is a philosophical work written by Danish philosopher Søren Kierkegaard in 1844. The original 1944 English translation by Walter Lowrie (now out of print), had the title The Concept of Dread. The Concept of Anxiety was dedicated "to the late professor Poul Martin Møller". He used the pseudonym Vigilius Haufniensis (which, according to Kierkegaard scholar Josiah Thompson, is the Latin transcription for "the Watchman" of Copenhagen) for The Concept of Anxiety. For Kierkegaard, anxiety/dread/angst is unfocused fear. Kierkegaard uses the example of a man standing on the edge of a tall building or cliff. When the man looks over the edge, he experiences a focused fear of falling, but at the same time, the man feels a terrifying impulse to throw himself intentionally off the edge. That experience is anxiety or dread because of our complete freedom to choose to either throw oneself off or to stay put. The mere fact that one has the possibility and freedom to do something, even the most terrifying of possibilities, triggers immense feelings of dread. Kierkegaard called this our "dizziness of freedom." Kierkegaard focuses on the first anxiety experienced by man: Adam's choice to eat from God's forbidden tree of knowledge or not. Since the concepts of good and evil did not come into existence before Adam ate the fruit, Adam had no concept of good and evil, and did not know that eating from the tree was "evil." What he did know was that God told him not to eat from the tree. The anxiety comes from the fact that God's prohibition itself implies that Adam is free and that he could choose to obey God or not. After Adam ate from the tree, sin was born. So, according to Kierkegaard, anxiety precedes sin. Kierkegaard mentions that anxiety is the presupposition for hereditary sin (which Augustine was the first to call peccatum originale, "original sin"). Kierkegaard observes that it was the prohibition itself not to eat of the tree of knowledge that gave birth to sin in Adam. The prohibition predisposes that which breaks forth in Adam's qualitative leap. He questions the doctrine of Original Sin, also called Ancestral sin., "The doctrine that Adam and Christ correspond to each other confuses things. Christ alone is an individual who is more than an individual. For this reason he does not come in the beginning but in the fullness of time." Sin has a "coherence in itself". In Rosenkranz’s Psychology there is definition of disposition [Gemyt]. On page 322 he says that disposition is the unity of feeling and self-consciousness. Then in preceding presentation he superbly explains "that the feeling unfolds itself to self-consciousness, and vice versa, that the content of the self-consciousness is felt by the subject as his own. It is only this unity that can be called disposition. If the clarity of cognition is lacking, knowledge of the feeling, there exists only the urge of the spirit of nature, the turgidity of immediacy. On the other hand, if feeling is lacking, there remains only the abstract concept that has not reached the last inwardness of the spiritual existence, that has not become one with the self of the spirit." (cf. pp. 320–321) If a person now turns back and pursues his definition of "feeling" as the spirit’s immediate unity of its sentience and its consciousness (p. 142) and recalls that in the definition of Seelenhaftigkeit [sentience] account has been taken of the unity with the immediate determinants of nature, then by taking all this together he has the conception of a concrete personality. [but, Kierkegaard says] Earnestness and disposition correspond to each other in such a way that earnestness is a higher as well as the deepest expression for what disposition is. Disposition is the earnestness of immediacy, while earnestness, on the other hand, is the acquired originality of disposition, its originality preserved in the responsibility of freedom and its originality affirmed in the enjoyment of blessedness. If a person does not first make clear to himself the meaning of "self," it is of no use to say of sin that it is selfishness. Only when the concept of the particular is given can there be any talk of selfishness, however, no science can say what the self is without stating it quite generally. And this is the wonder of life, that each man who is mindful of himself knows what no science knows, since he knows who he himself is, and this is the profundity of the Greek saying know yourself, which too long has been understood in the German way as pure self-consciousness, the airiness of idealism. It is about time to seek to understand it in the Greek way, and then again as the Greeks would have understood it if they had possessed Christian presuppositions. However, the real "self" is posited only by the qualitative leap. In the prior state there can be no question about it. Therefore, when sin is explained by selfishness, one becomes entangled in indistinctness because, on the contrary, it is by sin and in sin that selfishness comes into being. Hegel looks at eternity as an unfolding, or a transition, from stage to stage, from the Persian, to the Syrian, to the Egyptian religion as Object, Good. Kierkegaard didn't want to be double-minded about the good, and, after his own fashion, created his own system of good in 1847 in Edifying Discourses in Diverse Spirits. He brought eternity into relation with his own feelings of guilt in relation to Regine Olsen, his fiancé, in Stages on Life's Way (1845) because he had so much anxiety about disclosing his inner being to her, it was "terrifying". However, early on, Kierkegaard had written about moving forward in regard to himself, Regine, and any other single individual. He wrote the following in 1843 and 1845. The book seems to be highly interpretive in its title. Is it dread, anxiety, angst, or sin? Or is the final word of the title something else. It's up to the individual reader to determine that. If the single individual can't make a choice as to the meaning of a word then all choice has been taken away from the individual. Lowrie decided the book deals with "an apprehension of the future, a presentiment of a something which is a nothing" which must be fought against. But fought on the inside with oneself about what "you" as the single individual can become. Professor Lorraine Clark put it this way in 1991, "Existence is not just a given but also a task, Kierkegaard insists-the task of becoming oneself; for "actuality (the historical actuality) relates itself in a two-fold way to the subject: partly as a gift which will not admit of being rejected, and partly as a task to be realized" (Concept of Irony, Hong p. 293). One cannot become all possibilities simultaneously in reality (however possible this may be in thought, as he readily acknowledges); one must become some one thing in particular. Otherwise, one remains abstract." And Lee Hollander writes of what he perceived as Kierkegaard's problem which could also be every individual's problem. Robert Harold Bonthius discusses Kierkegaard's idea of dread in his 1948 book Christian Paths to Self-Acceptance, "Because the original Reformation and the subsequent Protestant scholastic doctrines of man’s depravity are distorted by literal ism, we will turn to those in our day who have revived Reformation thought, the so-called neo-orthodox theologians, for explanation of this profound view of sin and its importance for true self-acceptance. It is important to bear in mind, however, that man’s sinfulness is still conceived of the preached about in the undialectical forms of the past. Especially is this characteristic of flourishing sectarian bodies here in America-groups which are able to number their adherents in tens of thousands. 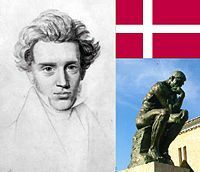 It is Soren Kierkegaard of Denmark who has provided the key to modern reinterpretation of this austere doctrine of sin with his analysis of the relation of sin to anxiety. "Dread or anxiety," he explained "is the psychological condition which precedes sin, comes as near as possible to it, and is as provocative as possible of dread, but without explaining sin, which breaks forth first in the qualitative leap." Kierkegaard saw this "sickness unto death" as the inherent factor in human existence, and he taught that a "synthesis" was needed, by which he meant a vital relationship of man with God by which man may resolve his inner conflicts and live at peace with himself." "There are two kinds of existentialist," Jean-Paul Sartre declared in 1947–"the Christian and the atheistic existentialist." Existentialism means, Sartre explained, that "first of all, man exists, turns up, appears on the scene; and then, only afterwards, man defines himself". (...) Rational thought was no help; in fact, rational explanations are presumptuous and ridiculous, according to Kierkegaard, because no man can have his identity or duty shown to him by reason. The only way for an individual to discover himself is to investigate his own unique existence-his own stresses, desires, tensions. Only through such an inquiry can an individual grasp any truth-insofar as truth is available to the individual. A true Christian, Kierkegaard continues, must recognize that he exists in a mysterious, irrational world, where he must choose with no possibility of knowing whether the outcome will be his salvation or damnation. This "existential" choice, he explains, involves a "leap of faith". (...) Although atheistic existentialists reject Kierkegaard’s belief in God, they tend to accept his idea of the unique, solitary individual who can discover himself only through personal choices and actions. "The existentialist thinks it extremely distressing that God does not exist," Sartre declares, "because all possibility of finding values in a heaven of ideas disappears along with Him." Without God or absolute values, men are "condemned to be free," Sartre continues, "Because once a man is thrown into this world, he is responsible for everything he does." ^ "If a person is unwilling to make a decisive resolution, if he wants to cheat God of the heart’s daring venture in which a person ventures way out and loses sight of all shrewdness and probability, indeed, takes leave of his senses or at least all his worldly mode of thinking, if instead of beginning with one step he almost craftily seeks to find out something, to have the infinite certainty changed into a finite certainty, then this discourse will not be able to benefit him. There is an upside-downness that wants to reap before it sows; there is a cowardliness that wants to have certainty before it begins. There is a hypersensitivity so copious in words that it continually shrinks from acting; but what would it avail a person if, double-minded and fork-tongued he wanted to dupe God, trap him in probability, but refused to understand the improbable, that one must lose everything in order to gain everything, and understand it so honestly that, in the most crucial moment, when his soul is already shuddering at the risk, he does not again leap to his own aid with the explanation that he has not yet fully made a resolution but merely wanted to feel his way. Therefore, all discussion of struggling with God in prayer, of the actual loss (since if pain of annihilation is not actually suffered, then the sufferer is not yet out upon the deep, and his scream is not the scream of danger but in the face of danger) and the figurative victory cannot have the purpose of persuading anyone or of converting the situation into a task for secular appraisal and changing God’s gift of grace to the venture into temporal small change for the timorous. It really would not help a person if the speaker, by his oratorical artistry, led him to jump into a half hour’s resolution, by the ardor of conviction started a fire in him so that he would blaze in a momentary good intention without being able to sustain a resolution or to nourish an intention as soon as the speaker stopped talking. ^ Immanuel Kant, Religion Within the Limits of Reason Alone. ^ Kierkegaard discusses Hebart in relation to the question of whether an individual would begin with the negative or the positive. This page was last edited on 28 December 2018, at 14:51 (UTC).